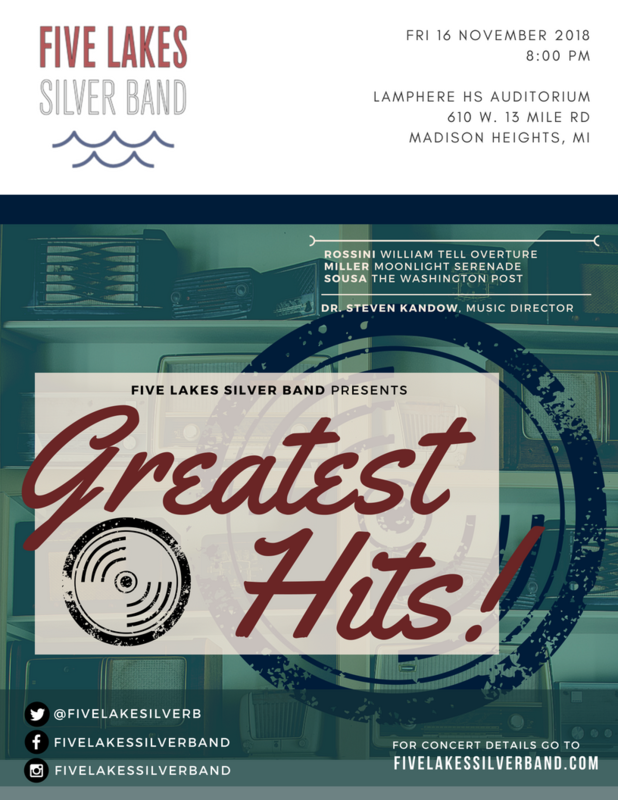 Five Lakes Silver Band is taking an exciting new approach to the familiar Greatest Hits compilation. Join us for a concert program containing several pieces of music that might be considered their composers' "Greatest Hits". Mozart will be represented by Eine Kleine Nachtmusik. J.S. Bach will be symbolized by Jesu, Joy of Man's Desiring. Plus, many more favorites by Rossini, Grainger, and Sousa. This is not a Greatest Hits you can get on a CD - you'll just have to plan be there! We love playing for large audiences, so follow us on social media and share our events with family and friends! For any questions, please contact us through the Facebook event or by email. Want to be reminded of our upcoming concerts?